The Hicksville Fire Department in 1930. In what sounds like an urban legend, the Hicksville Fire Department— beloved by residents and famous for popcorn ball throwing the Sunday after Thanksgiving—rose from the ashes of a passing thunderstorm. It was the summer of 1866. The hot, humid days of a typical Long Island summer brought with it a storm whose lightning sparked a fire that ravaged a set of buildings on Old Country Road. In the days following, the aftermath set off a discussion for the need of a fire department. In 1868, the first fire company was finally established, and was officially organized as Protection Hook and Ladder Company One. As the Hicksville community grew, the need for more and better equipment grew as well, and in 1876 a second company was established as Chemical Engine Copmany One, later to be named Independent Engine and Hose Company Two in 1892. 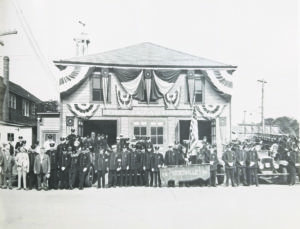 The same year that Company Two was founded, a small piece of land was arranged for the building of a firehouse complete with a hip roof, small tower, flag pole and bell. Lettered on the front was “Chemical Engine Co. 1.” An old hand-drawn wagon was given to the company to serve as a truck for carrying a hose. In 1890, citizens concerned for fire safety raised $700 that was contributed to obtaining a ladder truck. Accordingly, Co. 1 had a truck house, complete with a bell, built to house the new vehicle. By 1893, Citizens Engine Company Three was formed and in February, a joint meeting of the three companies called for the organization of a proper fire department, thus formally establishing the Hicksville Fire Department. A fire district, to “furnish all firefighting appliances necessary to the good and welfare of the companies” was founded in 1902. Growing just as fast then as it continues to grow now, Hicksville was a booming community and found the need for Volunteer Engine and Hose Company Four in 1904 and Emergency Company Five in 1928. The Hicksville Fire Department Headquarters as it stands today on East Marie Street. On Nov. 4, 1904, the Fire District let the community vote on $6,000 to be used for the building of a proper fire house in a central area of town. Out of 103 votes, 60 votes for the building set things in motion, and the firehouse officially opened in 1906 where Peppercorn’s stands today. Now, Station One is just across the street from Peppercorn’s at 20 E. Marie St. The newer, bigger building was built in 1932 for $88,000 after the Board of Fire Commissioners recognized the need for more room to house all of the necessary equipment. As it stands today, the Hicksville Fire Department has grown to include Hook and Ladder Company Six (1956), Engine Company Seven (1957), Floodlight/Heavy Rescue Company Eight (1966), a Haz-Mat team, a Fire Police squad, an EMS team, the Ladies Auxiliary group and the Hicksville Junior Firefighters program. 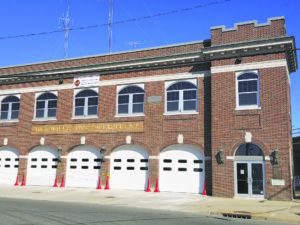 The department now has three more stations outside of its headquarters on East Marie Street—Station 2 (1956) serving the northeast section of Hicksville, Station 3 (1956) serving the northwest section and Station 4 (1990) serving the southwest section. Housed across these four stations are the department’s numerous hose engines, ladder trucks, a heavy rescue truck, and EMS, fire police and ambulance vehicles.